Pick Analysis: Rayne Dakota "Dak" Prescott proved himself to be an excellent college quarterback in 2014, breaking all sorts of school records (4,435 yards of total offense, 27 touchdown passes, 61.6 completion percentage), named a finalist for the Maxwell, Davey O'Brien, Manning, and Unitas Golden Arm awards and helping his team to a 10-3 record. The two-time first team All-SEC pick ended up with 38 MSU records after a senior year where he won the Senior CLASS Award as the top scholar-athlete on and off the field. Prescott led the team in passing (3,793 yards, 66.2 completion percentage, 29 TD, five INT) and rushing (588 yards, 10 scores) for the second straight year in 2015, joining Tim Tebow as the only two players in SEC history to accomplish that feat. Prescott got on the radar as a redshirt freshman in 2012, playing as a red-zone quarterback, scoring four times as a passer and four as a runner. The next year, he started seven games in two-quarterback system (Tyler Russell), throwing with 1,940 yards, and 10 touchdowns (seven INT), missing two games with an elbow injury. Just two days after his pro day, Prescott was arrested on suspicion of driving under the influence. Published: March 10, 2016 at 05:24 p.m.
Watch Mississippi St. QB Dak Prescott work out at the 2016 NFL Scouting Combine. Published: April 5, 2016 at 07:06 p.m.
Take a look at the college highlights of Mississippi State quarterback Dak Prescott. 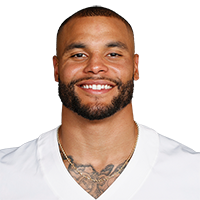 Published: Feb. 26, 2016 at 02:04 p.m.
Former Mississippi State quarterback Dak Prescott has a passion for football and strives to be the best. A Louisiana native, he also loves food.